Conifer trees for sale in Australian Nurseries include a wide range of plants suitable for use as garden trees, windbreaks, ground cover plants or for growing in pots . These are a varied group and include some well known garden plants including : Abies, Cedars, Cypress Trees, Pines, Spruce Trees, Tsuga and many others. Cedrus deodara (see picture right) is a very graceful and stately conifer tree from the Himalayas, well suited to use in larger gardens. So a well known example of a Conifer tree would be a Redwood, Spruce or what we commonly call a Pine tree. 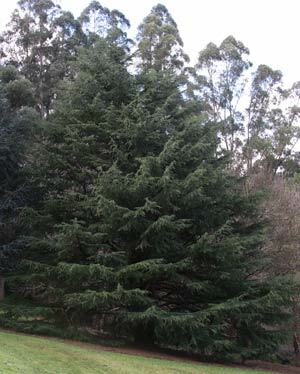 However even with the Pine Tree example, many varieties are to be included. And the name itself, it simply means cone-bearing (coniferous) trees. Conifers offer us a wide range of landscaping trees from tall feature trees to low growing ground cover plants. They come in upright forms as well as some with weeping or pendulous habits. They are suited to a range of landscaping styles including both formal and informal gardens. Those conifers suited as garden trees range from low growing ground covers to large specimen trees. They make great feature plants, screening plants and ground covers. A versatile plant and often underrated as garden specimens Conifer Trees are renown for variety in colour, size and form from large trees to dwarf conifers and small low growing ground covers, conifers are a fantastic landscaping plant. Almost all species are evergreen and add year round shape colour and form to the garden. With so many different varieties of conifers available from low growing ground covers to small weeping specimen trees and large windbreak trees, these are truly versatile trees.